The 2015 High School Tournament season is from September to December 2015; registration is open until the end of the 2D Practice Round at the end of September 2015 (see details below). The tournament is open to any group of students in USA High School (grades 9-12) or ESA Upper Secondary/Preparatory or equivalent pre-college level. 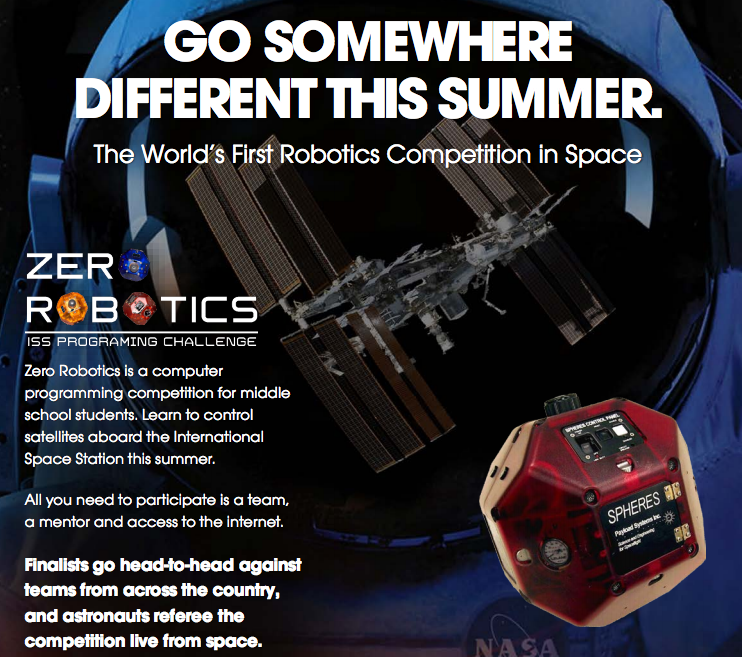 "Zero Robotics" tournaments open the world-class research facilities on the International Space Station (ISS) to high school students. 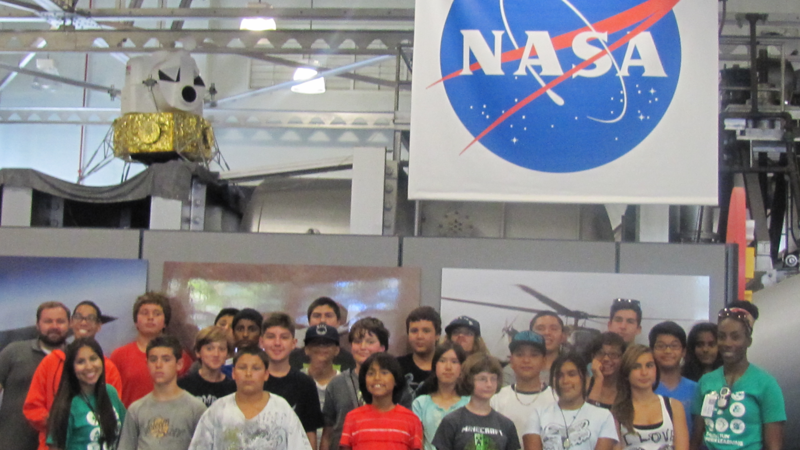 Students write programs at their high schools that may control a satellite in space! The goal is to build critical engineering skills for students, such as problem solving, design thought process, operations training, and team work. 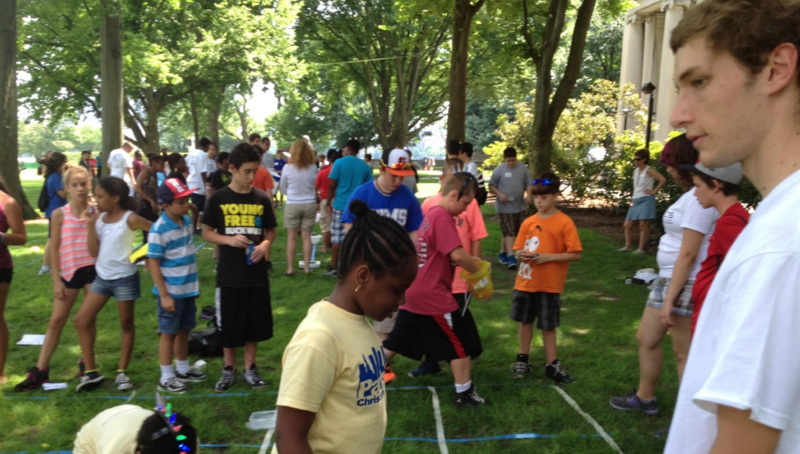 The participants compete to win a technically challenging game by programming their strategies into the SPHERES satellites. The game is motivated by a challenging problem of interest to NASA and MIT. 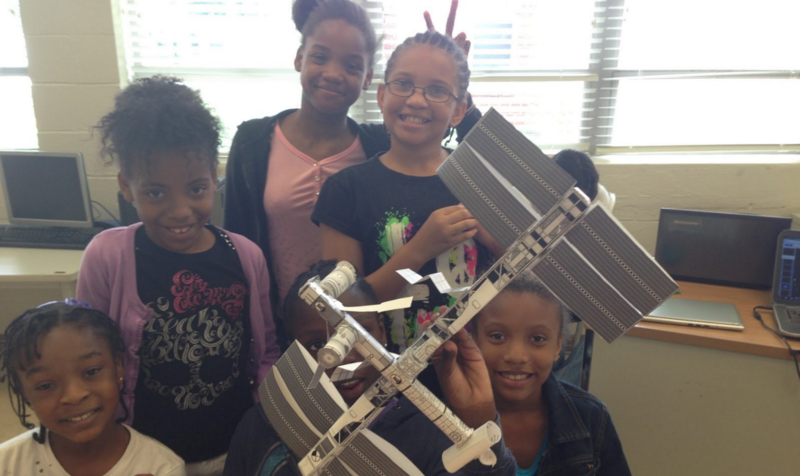 The programs are "autonomous" - that is, the students cannot control the satellites during the test itself. The tournament begins with simulations in phases from 2D to 3D, gradually increasing in difficulty. After elimination rounds, the finalists will see their code run in the SPHERES satellites aboard the International Space Station with live transmission from space. The finals take place simultaneously at MIT and an ESA site in Europe and are also webcast live to all participants so that remote viewing is possible. Student teams can create, edit, save and simulate projects online. They may use a graphical block diagram editor or a C editor to write code, then simulate their program immediately and see the results in a flash animation. 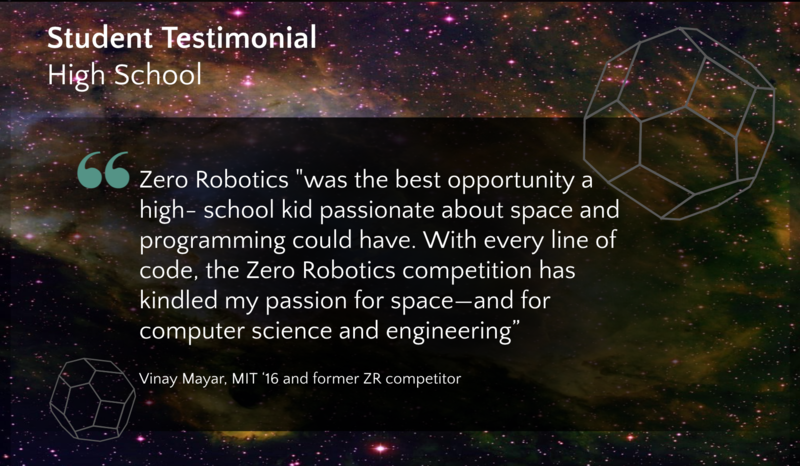 MIT provides the simulation and C programming interfaces via the Zero Robotics website--no special software is required. The simulation also enables teams to compete against themselves or pre-coded standard players and challenge other teams informally; students have ample opportunities to test different strategies before submitting their code for a formal competition. All submissions to challenge others and to the competition are via the website. 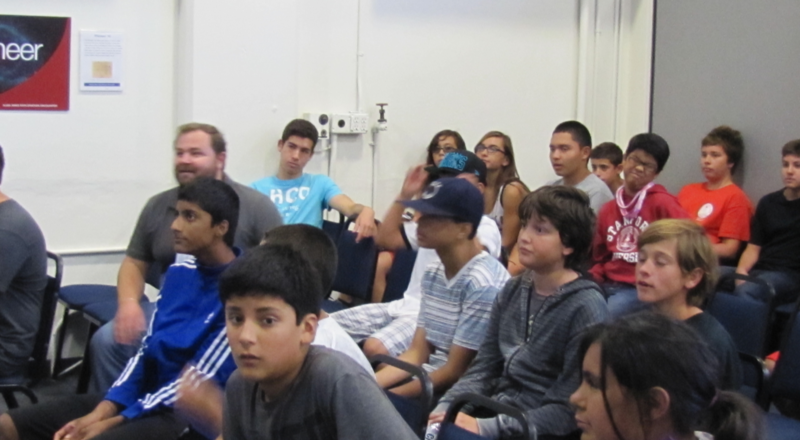 Students also have access to online tutorials and an MIT technical support system. Registration is done online. In order to register the team mentor needs to have an active Google account. You can choose an existing one or you can create a new one. The mentor (who submits the application) must have their own account. Students may use their own accounts, or they can have special ZR accounts created after the mentor submits the application. The contest begins with several simulation competitions held online at the Zero Robotics website that gradually increase in difficulty. Finalists from the online simulation phase will proceed to the ISS, where an astronaut conducts a live competition with the SPHERES satellites and in microgravity! This final ISS event will be hosted simultaneously at MIT and an ESA site with special audio/video links. 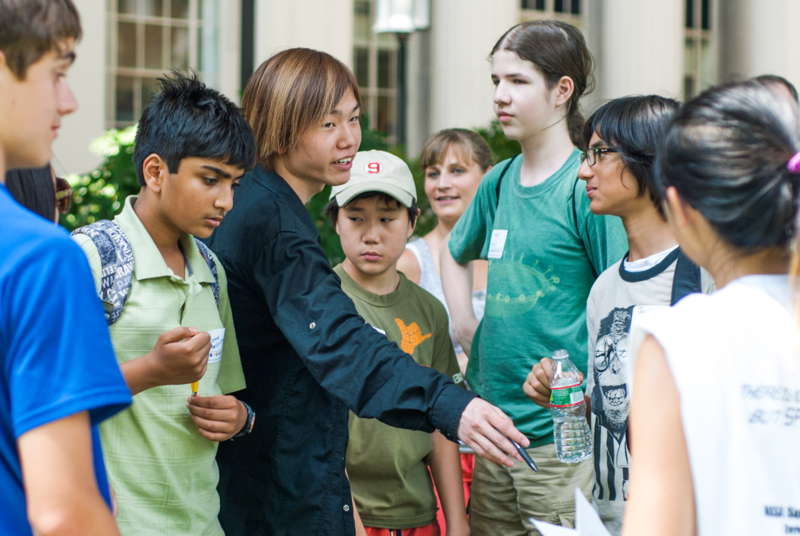 All finalist teams are invited to attend in person at either ESA or MIT; all teams (regardless of reaching the ISS Finals) may visit MIT for the finals. 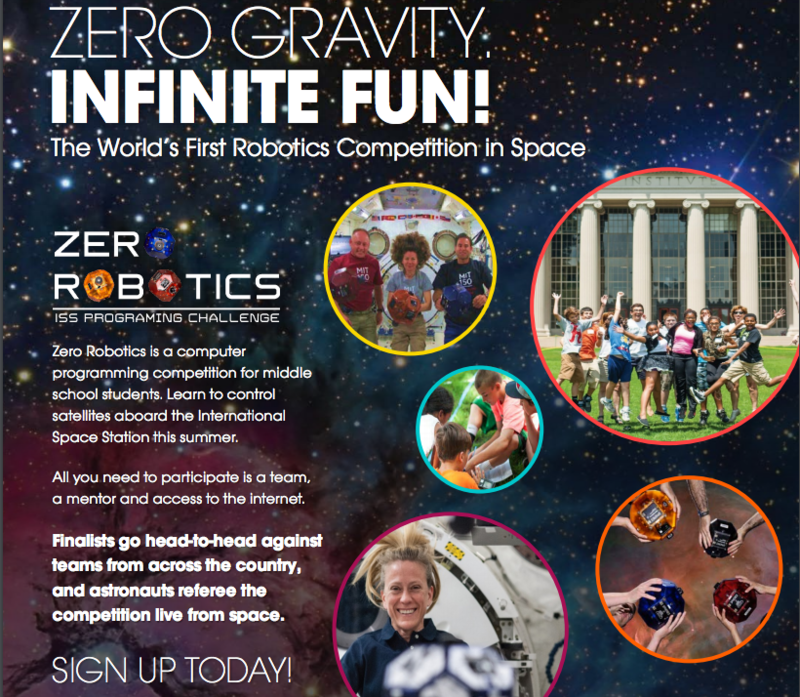 The Zero Robotics High School Tournament 2015 (the “Tournament”) is run by the Massachusetts Institute of Technology Space Systems Laboratory, 70 Vassar St., Cambridge, MA 02139 (“MIT”). The tournament is sponsored by CASIS and ESA; in addition CASIS provides the agreements for use of the ISS. The Tournament is open to teams of High School students who meet the application criteria and submit a valid application. By participating in the Tournament, each participant agrees to abide by the Tournament Rules (to be published with the season's Game Manual) and to abide by the decisions of the Tournament administrators. Any accredited high-school (grades 9-12), Upper Secondary, or equivalent grade-school / pre-college level program, including home-schooling, in the USA, Russia and ESA member states can register a team of students; multiple high-schools can join to form a single team. 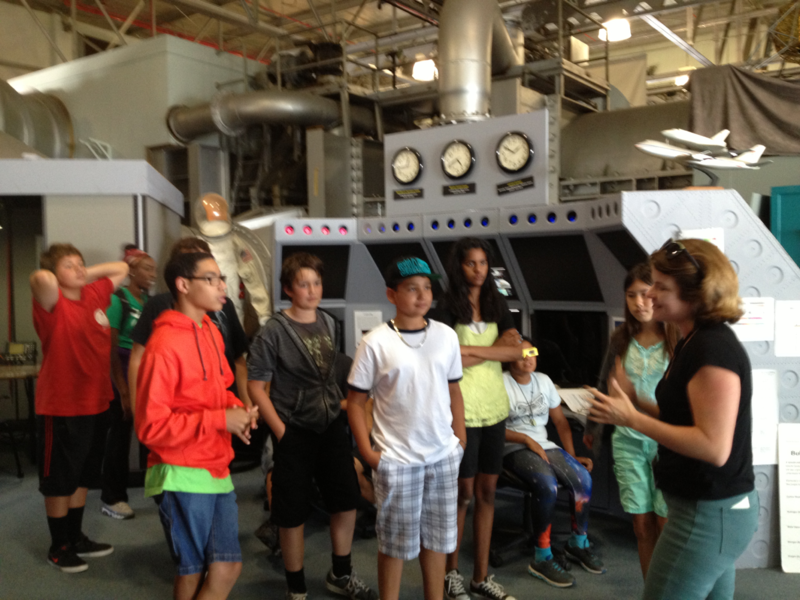 The students must be ages 14-20; they cannot be in college/university or other type of post-grade-school education. 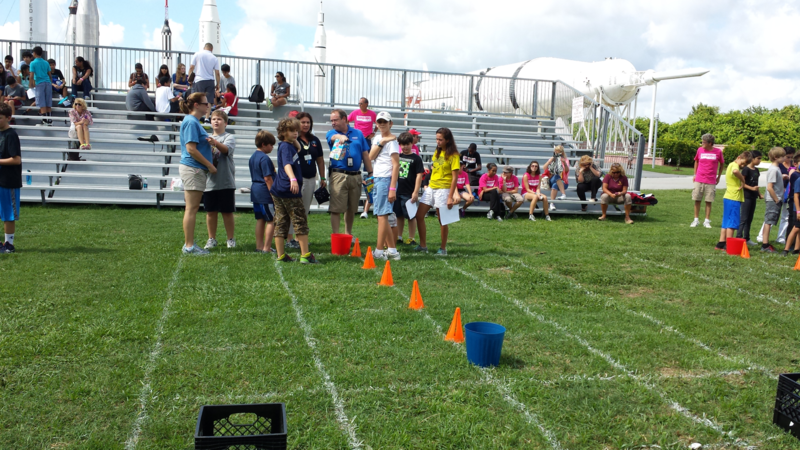 Each team must be between 5-20 students; any ESA Teams beyond 10 students must describe their need for a large team in their application. Unless permissions is granted on a case-by-case basis, each high-school/organization may only have one team of 5-20 students. In the case that multiple teams are approved in a single school/organization, then (i) each team must have at least 12 students (ii) the teams must work independently of each other (iii) the teams may not be part of the same alliance (iv) teams may not exchange students at any point during the tournament. All the students in the teams must create their own Zero Robotics account and the team mentor/leader must create the complete team roster. 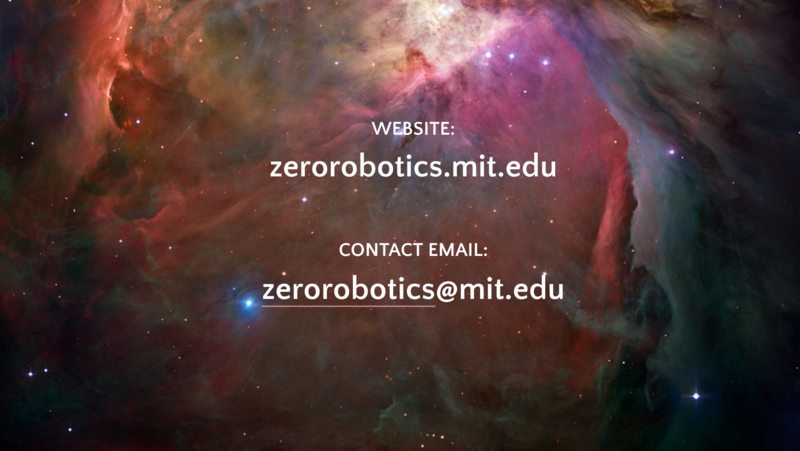 Only the students registered in the Zero Robotics website team roster will be considered part of the team. All USA States and territories may participate. There is no limit to the number of USA teams that may participate. Any teams from Russia may participate. There is no limit to the number of Russian teams that may participate. Participation of European teams is restricted to teams resident in member states of the European Space Agency (ESA). The list of participating nations is: Austria, Belgium, Czech Republic, Denmark, Estonia, Finland, France, Germany, Greece, Hungary, Ireland, Italy, Luxembourg, the Netherlands, Norway, Poland, Portugal, Romania, Spain, Sweden, Switzerland and the United Kingdom. Only teams from the listed countries will be approved for participation. Each participating ESA Member State will have a limit of 25 teams that can move on to the 3D round (the top 25 teams will be determined by the 2D score against a blank opponent). NOTE: Italian teams must apply separately through the Politecnico di Torino. Italian teams selected through the pre-selection will be communicated by PoliTo to MIT for inclusion in the tournament. NOTE: Selected other countries may participate in pilot programs by invitation, with limited number of teams. Their participation will be specified in the Tournament Rules released with the Game Manual. In order to provide new teams with sufficient time to learn how to use Zero Robotics, the 2D Phase (throughout September) will be a practice run that does not count towards competitive elimination. The elimination phases will start with the 3D simulation during October. However, in order to proceed to the 3D phase, the teams must submit a working project which scores any points. NOTE: The dates listed here are preliminary and subject to change. We do not anticipate a change of more than a few days to the kickoff and final submission deadlines. The Tournament begins at 13:00:00 USA ET on 2015-Sep-12 (Sat) and ends at 23:59:59 USA ET on 2015-Dec-20 (Sun) ("Tournament Period"). Registration for the Tournament will remain open until to 2015-Sep-30 (Wed). To be an official competitor you must submit code to the 2D Practice competition on 2015-Oct-02(Fri). 2016-Jan-25 (Mon), TBD ISS Finals! 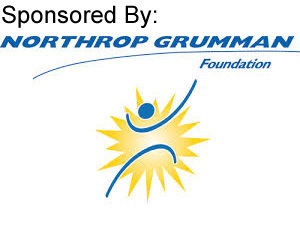 By participating in the Tournament, each participant agrees that under no circumstances, including, but not limited to, negligence, shall MIT, its partners, or the Sponsors, or their respective officers, directors, employees, shareholders, agents, successors, and assigns (the "Released Parties") be liable for any direct, indirect, incidental, special, or consequential damages arising out participation in the Tournament, even if any or all of the Released Parties have been advised of the possibility of such damages. Participation by creating accounts and/or submitting an application and/or submitting code constitutes Contestant's full and unconditional agreement to and acceptance of the Tournament Rules. All federal, state, and local laws and regulations apply. Code and documentation submissions that are provided by participants to the web site (“Submissions”) will be shared publicly with all participants after the Tournament. 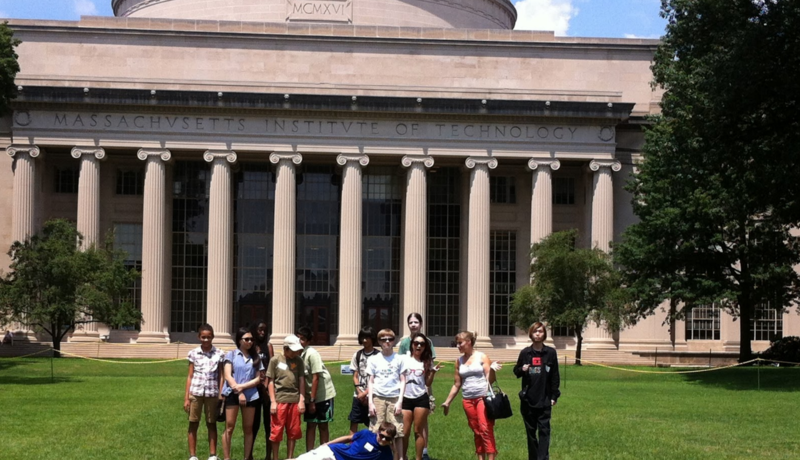 As a condition of participation, all participants and teams grant to MIT, and the Sponsors a perpetual, royalty-free, irrevocable, non-exclusive license to use, reproduce and publish any and all Submissions and to permit MIT, the Sponsors, and other third parties (including without limitation participants’ teammates, and other teams) to copy, modify, prepare derivative works of, make and use their Submissions.